Our standard prices are the same for printing and copying. Our printers are also high quality copiers. However, a copy will always be just that: a copy. A print will be at the best possible quality so it makes sense, wherever possible, to print from an electronic original rather than copy from paper. Black text usually copies OK but you’ll notice a difference with anything in colour, especially photographs. 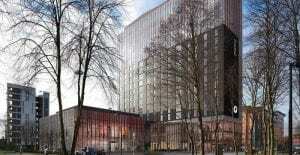 Price Calculator – get a price for any quantity instantly. For both our full colour and mono (black only) copying, the price is variable: the more you have, the cheaper it is per copy. Note that our copiers do not print to the edge so there will be a white border of approx 5mm as standard. Also, we cannot copy anything larger than A3. For sizes A2 and up, we can only print. Not all printing is liable for VAT – more information on our VAT page. Do-it-yourself for even cheaper copies! If you are working to a very tight budget, MuPrint offers a black & white self service copier available for customers’ use. The cost is 4p per A4. We don’t offer a self-service colour copying facility. If you have an A4 multi-page thesis, dissertation or report, a mixture of mono pages and maybe with some colour photos or charts also, you’re in the right place! Simply count the number of mono (black & white) printed pages (sides of a sheet) and the number of colour paper pages (sides of a sheet) you want printing and this page will calculate the price. It’s so easy! We can also bind it using the Metalbind channel binding system, with the option of gold lettering on the spine. 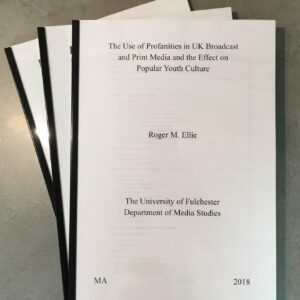 MMU PhD Thesis: there is no requirement for lettering on the spine. 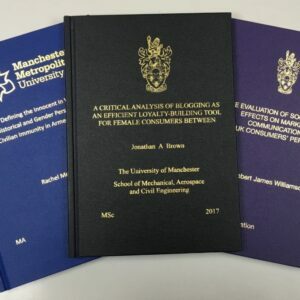 University of Manchester Thesis or Dissertation: gold lettering is normally required on the spine. 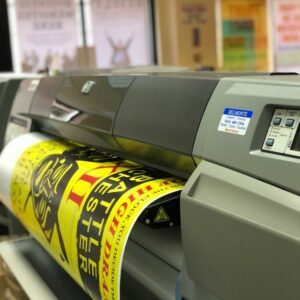 Manchester businesses, university staff and departments and, yes, even students can now get their posters printed quicker than ever thanks to MuPrint’s on-site, wide-format poster printer! Offering six colour 1200dpi poster printing for realistic flesh tones and pastel colours on 170/190gsm satin coated paper, our poster printers can print BIG posters up to 41 inches wide – that’s large enough for A2, A1 and even A0. A3 posters are printed on our high quality laser printers for speed and great value on gloss or silk coated 200gsm paper. Everyone benefits from our super low prices – everybody now pays the same low price! If you also want it hardback binding, there are a number of options available too. 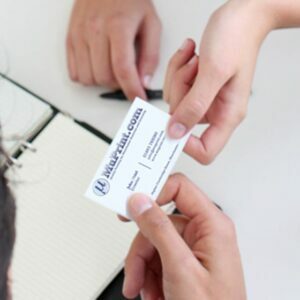 MuPrint’s Standard Business Cards are very popular and now THICKER THAN EVER! That’s because our new Digital Press can take the thickest card to make solid and durable business cards. Feel the difference! We only print on thick, high quality card which provides a fantastic finish and maintains that professional image. The quality of the colour is amazing! Ready within 24 hours of receiving your print ready artwork – even sooner if you go for our fastest option and tell us!